A typical massive galaxy that existed about 5.5 billion years after the Big Bang. The left image was taken in visible light with the Hubble Space Telescope. The right image is an overlay of the Plateau de Bure millimetre interferometer image. The stellar birth rate of the young universe has long beenknown to be much higher than it is today, but scientists weren't sure why theearly universe was so fertile. A new study finds that this could be because early galaxieshad more cold gas to "feed" to forming baby stars. When astronomers look far across the cosmos with powerfultelescopes, they?re effectively lookingback in time. 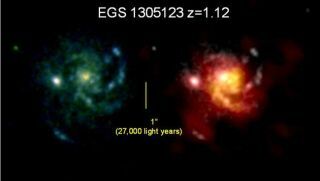 Galaxies in the earlyuniverse ? a mere 3 or 4 billion years after theBig Bang ? seem to have formed stars more or less continuously with atleast ten times the rate seen in similar-mass systems in the local universe,which represents modern time in the 13.7-billion year history of the universe. The fundamental question facing astronomers was whetherthese large star-formation rates were caused by larger reservoirs of coldmolecular gas (which represents the ?food'? for newly formed stars), or whetherstar formation in the young universe was much more efficient than it is today. A major study of distant, luminous star-forming galaxies atthe Plateau de Bure millimeter interferometer in the French Alps has nowresulted in a breakthrough by getting a direct look at the star-formation"food." "We have been able, for the first time, to detect andimage the cold molecular gas in normal star-forming galaxies, which arerepresentative of the typical massive galaxy populations shortly after the BigBang," said Linda Tacconi from the Max Planck Institute forExtraterrestrial Physics and lead author of the paper describing the research,which is detailed in the Feb. 11 issue of the journal Nature. The study showed that galaxies present when the universe wasonly about 40 percent of its current age had five to 10 times as much gas andmore recently formed galaxies do. The finding fits in with theories on galaxy formation andevolution. As galaxies form and grow, gas cooled and pooled up in concentrationsof mysterious darkmatter (so-called "dark matter halos"). Over cosmologicaltimescales, gas accreting from these halos onto the proto-galaxies, andcollisions and mergers of galaxies, subsequently led to the hierarchicalbuild-up of galaxy mass. "Given that these galaxies were forming gas at a highrate over long periods of time, this means that gas must have been continuouslyreplenished by accretion from the dark-matter halos, in excellent agreementwith recent theoretical work," Tacconi said. The scientists think these results will help revise futuremodels of the evolution of galaxies.